My thoughts on programming (mostly, but not exclusively, on Apple platforms) design, technology, judaism, and life in general. Last year I had the opportunity to travel to San Francisco in order to attend to Apple’s yearly developers conference: WWDC - World Wide Developers Conference. Around 7 years ago, it started becoming a dream for me to be there personally. The legendary Keynotes, presented by Steve Jobs and the rest of Apple’s software and hardware teams, were one more ingredient that arose my passion for Software development. Getting there, meeting Apple engineers and even some of Apple VP’s, and being present in a Keynote, was a milestone for me. Did I mention the craziness to get tickets last year? All the 5,000 tickets sold out in 72 seconds - and I was one of the ninjas who were fortunate to fill everything out quickly. However, this year Apple decided it would be different. Eligibility to tickets would be decided in completely random lottery, to the despair of many developers. 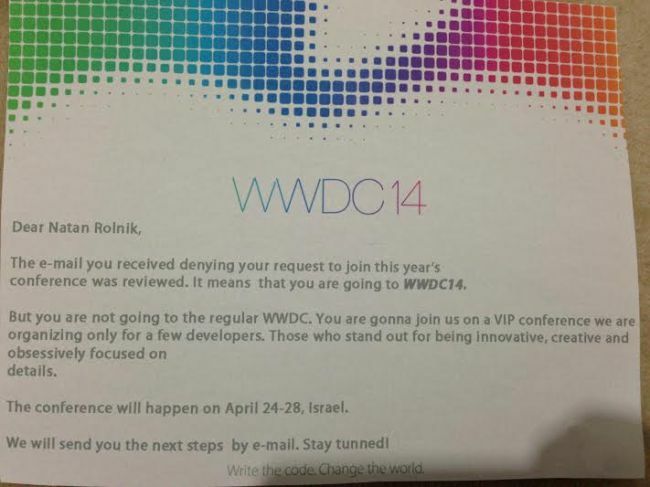 They announced that we would receive e-mail informing the status on April 7, 5:00 p.m. PDT (3:00 a.m. Israel time). 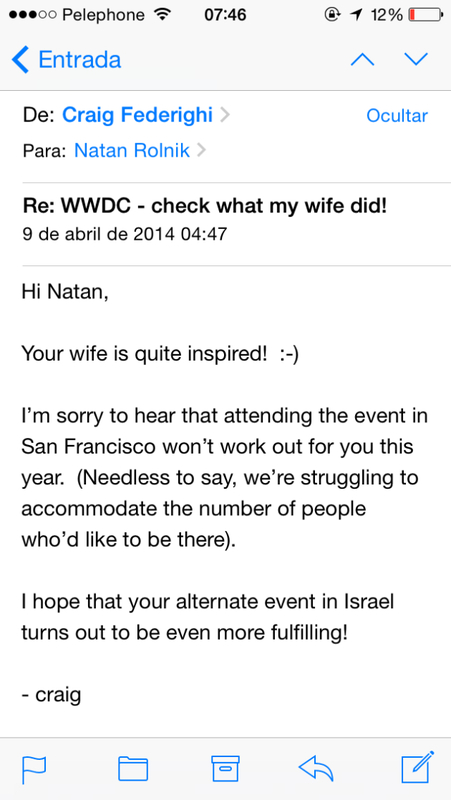 And indeed, 04:00 Israel time, I received the confirmation - I was not selected to purchase a ticket. After getting the chance to be there once (and enjoying so much as I did, knowing people who struggle with code just like me, from all over the world), I wanted even more to go this time. So you can imagine how much I was disappointed. I started my day very upset. If I was already fine with and conformed to the situation at the evening, this cute piece of paper made me feel much happier. Sometimes, you find love in the situations you less expect (and even more when you have a 3 weeks old baby). So I decided to share this with someone at Apple. Who better than Craig Federighi, Apple’s SVP of Software Engineering, a.k.a. Hair Force One, the new Apple superstar - and who I had a quick chance to meet and talk at WWDC 2013. Also, after talking to him, I had that feeling we have when you meet a Mentsch - a word in Yiidish to describe someone polite, with integrity, that talks humbly to everyone. I wanted to show him how much I wanted to go, how I was feeling, and also what my wife did to make me feel better - I was sure he would like it. I tried some email addresses based on his name - and after some shots, the email didn’t return with an error. So I went to sleep and thought: “Fine, he will see this and will be happy about it”. Indeed, he liked it. But more than that, I woke up with his reply in my inbox - and another confirmation that he is a Mentsch. The bottom line is, no matter where, spread the love. Inside your house, in your work, or with people you don’t know. To paraphrase this year’s WWDC promo, Write the code. Spread the love. Change the World. This site is Open Source. © 2019 Natan Rolnik's blog. Powered by Jekyll & Minimal Mistakes.